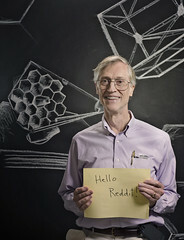 On Monday, November 26, 2012, Nobel Laureate and James Webb Space Telescope project scientist spent about an hour answering questions on Reddit. You can go read the full “Ask Me Anything” thread and the interesting discussion it provoked, but we’ve pulled out the questions he directly answered here (thanks to Reddit for compiling a handy table of all of them). A: JWST has no liquid gases for cooling. Our early design had solid hydrogen instead, but we’ve replace that with a closed-cycle refrigerator using helium gas sealed into the equipment. So, fuel for station-keeping is the limiting factor. By the way we also use the fuel for countering the built-up torque due to solar photon pressure on the sunshield. A: JWST will orbit around L2 like WMAP. WMAP has been sent off into interplanetary space, so it’s orbiting the Sun after a very gentle push-off. A: JWST arrives around L2 in 2 months, which is about the same time it takes to cool down to operating temperature. We are expecting to be in routine science observing mode 6 months after launch. A: Good question! The James Webb Space Telescope is the next big thing in astrophysics, and the Decadal survey produced by the National Academy of Sciences says the next thing after that should be the WFIRST, an wide field infrared survey telescope. Now that the NRO has donated 2 sets of optics to NASA, perhaps one set will become WFIRST. We also have in mind plans for the next great X-ray observatory, and a search for gravitational waves using a space interferometer. I think we have at least a century of amazing ideas to carry out. A: Best thing about working for NASA: thinking about such wonderful possibilities and seeing ideas become reality. Also, I love working with teams of brilliant scientists and engineers every day. Each day is different, and I am so proud of what we are doing together. A: I think people have a really hard time grasping how empty outer space is, in the sense of immense distances between objects, and immense time spent going from one to another. There’s a lot of talk about space aliens as though it were physically possible for them to get here from somewhere else, and (sorry to say this) talk about human travel out of the solar system. We just don’t live long enough to do that. A: Dark energy is probably the hardest thing to study. We have no prediction that it can ever be observed in the laboratory, and the things we have in mind to do in astronomy can only reveal the history of the accelerating expansion, not the reason for it. A: I think JWST can produce stunning surprises in many areas. We don’t know how galaxies formed or when, we don’t know how they got supermassive black holes in their centers, we don’t know whether the black holes caused the galaxies to form or vice versa. We can’t see inside dust clouds where stars and planets are being born nearby, but JWST will be able to do just that. We don’t know how many planetary systems might be hospitable to life, but JWST could tell whether some Earth-like planets have enough water to have oceans. We don’t know much about dark matter or dark energy, but we are expecting to learn more about where the dark matter is now, and we hope to learn the history of the acceleration of the universe that we attribute to dark energy. And then, there are the surprises we can’t imagine! A: Great! No, I never regretted my choice to study physics. But today, something else might be fascinating too. Every day I read of breakthroughs in biology and technology that are breathtaking in their implications. For instance, people are designing a transistor that has only ONE atom! Then, there’s artificial intelligence, which has been harder than people thought, but is making progress. A: It was the one with the greatest unsolved problems! When I was a student, we didn’t know much about the elementary particles, but we had a chance to learn so much. Then, it turned out I had a good mind for physics and math, and it was a lot of fun learning how to think about the mysteries, like relativity and quantum mechanics. A: The Nobel work came by a roundabout path. My thesis project at Berkeley was chosen because it was exciting and I liked the professors. Then it failed to function and I thought I would give up on the cosmic microwave background radiation. Then, I was a postdoc doing radio astronomy and NASA asked for satellite proposals; that was 1974. I said, my thesis project failed, but it should have been done in outer space. So we wrote a proposal and it was chosen. A: About the Nobel, a lot of people thought the COBE was Nobel-quality work, but I thought, the competition is fierce, and only people like Einstein get on the list. So it was a lovely surprise! A: I think we will be swimming in oceans of pictures and data and new discoveries from JWST and other new equipment. Our ground-based telescopes will be about 3x larger than they are today and some of them may have the capability to directly image exoplanets using extreme adaptive optics. A: The L2 point: it’s unstable, but not very. We need to provide rocket force to achieve an acceleration of a few meters per second, per year! So basically the middle of that horse saddle is pretty darned flat. We have to fire the jets every few weeks, just for a short time. A: Solar radiation at L2 is about the same as elsewhere, there’s nothing special there. But we do have to protect the electronics from solar flares, which produce energetic electrons and protons that pass through and damage the electronics. So we design and test them to survive the dose, and we have some degree of shielding by the structure. We also fly two of everything where it’s logically possible. A: Yes, the end of fuel is the end of JWST’s useful life. If JWST leaves L2, it’s hard to communicate with it even if it can still point at targets. A: Looking at the stars was the beginning of quantitative science, and still propels new advances in technology as well as fundamental discoveries about our history and our place in the universe. People want to know how we got here, are we alone, and where we are going. Astronomy answers part of that. A: I think history. I know just enough to see the tremendous rate of progress since Archimedes, and I’m eager to see what the next discovery is every day. I also think a bit about human organizations, since science is such a social enterprise. If you read Darwin’s Origin of Species, a lot of the text is about thanking people for helping him get information. So scientists have been social since the beginning. A: Physics research underlies the progress in almost every area of science, from chemistry to biology to electronics to medicine, and physicists defined the html code for the Internet as we know it. You want to see tumors in your body, try tools from physics. You want to see better, try laser surgery using the math that we astronomers invented to see better on the ground and in space. You want to see oil reserves underground, use sound waves and the math that physicists invented. Then of course there is the cultural benefit of understanding who we are and where we could go if we try. A: Actually, we can’t observe the evolution of a single galaxy, because we live for only a century or so, and cosmic evolution happens over millions of centuries. So our method is to compare galaxies with each other and see how they look different as we look farther back in time. So far, we see that the galaxies we can see when the universe was young are a lot smaller than today’s galaxies, so we think that the early ones grew bigger by merging with each other. A: Actually, JWST can only observe the effects of dark matter and dark energy. But to uncover their nature, we need lab experiments, or maybe a comprehensive theory of everything. Both are hard, but worth the effort. A: Are you kidding! Of course not. Astronomers alone have a century of projects in mind. And we’ve barely begun to travel to the planets. I’m no expert on particle physics but I’m thrilled that a prediction was verified, one that seemed essential to our “standard model” of particles. But we know that model is incomplete, so there is more work to do, both theoretical and experimental. A: Yup! JWST coverage begins at 0.6 microns wavelength, which is visible. So some of our pictures may resemble the Hubble pictures, only with different details. Our great hope is to see something completely different from what we can imagine today. A: Biologists tell us that mankind is evolving rapidly right now, and they have the genetic evidence to prove it. But clearly our cultural and technical and social environments are evolving even faster, with no end in sight. A: JWST will surely be used for exoplanet research, with direct imaging (with coronagraphs) and with transit spectroscopy. It is not a substitute for SIM or TPF, which are still needed if you want to know a lot about exoplanets. Since only around 1% of exoplanets are transiting their stars, we will be missing most of them with JWST transit spectroscopy. A great help for exoplanets would be to survey the nearest brightest stars for transits, like an all-sky version of Kepler. A: The most interesting anomalies have to do with the largest scale structures, which appear to have a pattern that is a little surprising. So a hypothesis is that the pattern comes from the universe beyond where we can see. Maybe!